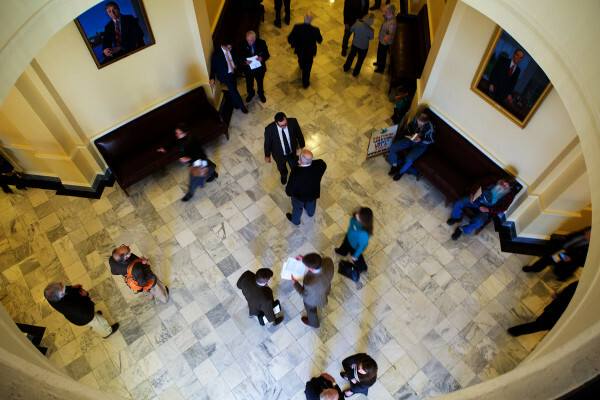 Legislators, lobbyists and other interested parties gather on under the dome at the State House in Augusta recently. AUGUSTA, Maine — Calling Maine’s 2016 ballot question to raise the hourly minimum wage to $12 onerous, but also likely to pass, key business groups on Thursday lobbied Republican lawmakers to put a competing, lower increase before voters. Details of the effort are expected to be released at a Tuesday news conference, but the landscape for moderating the current proposal supported by progressive Maine People’s Alliance, which would raise Maine’s hourly minimum wage to $12 per hour by 2020, seems challenging. Democrats could kill the more moderate proposal in favor of the existing referendum question, and not all Republicans are sold on compromising on the minimum wage. The Legislature has three options in dealing with the $12 proposal: It can put it before voters by itself, enact it, or place the “competing measure” on the ballot with it. The latter is what the Maine State Chamber of Commerce, the Maine Innkeepers and Maine Restaurant associations and the Retail Association of Maine want; leaders from this coalition pitched more than a dozen legislators — mostly Republicans — on it at a Thursday lunch at The Gin Mill in Augusta. They said the Maine People’s Alliance plan would harm businesses — Maine’s minimum wage would be higher than any other state’s current minimum under the proposal — but would likely pass, with an Associated Press poll in January finding 74 percent support nationally for a $12 hourly minimum wage. “I think what everyone’s looking at is the harsh reality of the fact that the extreme wage is going to pass if we don’t have something more moderate,” said Greg Dugal, executive director of the innkeepers and restaurant associations. The Maine People’s Alliance plan would hike Maine’s minimum wage of $7.50 per hour to $9 in 2017, then by an additional $1 each year until it reaches $12 in 2020 and thereafter indexing it to inflation. It also would raise Maine’s tipped minimum wage from $3.75 per hour to $5 in 2017, after which it will rise each year until it reaches the non-tipped minimum wage. Those tipped worker changes are “one of the most onerous provisions” in the proposal, said Curtis Picard, executive director of the retail association. Mike Tipping, a Maine People’s Alliance spokesman, countered by calling it “a huge boost to some of Maine’s lowest-paid and most-taken-advantage-of workers.” He said the groups are attempting “a sneaky play” to subvert the referendum process. “It’s very clear that they can’t have that public discussion, which is why they’re trying an end run through the Legislature,” he said. Democrats controlling the Maine House of Representatives could hold up any plan. They approved a bill last year that would have raised the minimum wage to $9.50 per hour by 2018, but it died between the House and the Republican-led Senate. Rep. Stacey Guerin, R-Glenburn, who expects to sponsor the compromise proposal, said she could support an increase to $8.50 in the first year that tops out at $9.50. “I can see the need for a compromise on it, and I think a lot of people want us to work together in Augusta,” she said. Unlike McCabe, Rep. Heather Sirocki, R-Scarborough, opposes any increase in the minimum wage. But she could vote with him for an opposite reason: She’d rather campaign against the Maine People’s Alliance plan than advance a smaller increase.